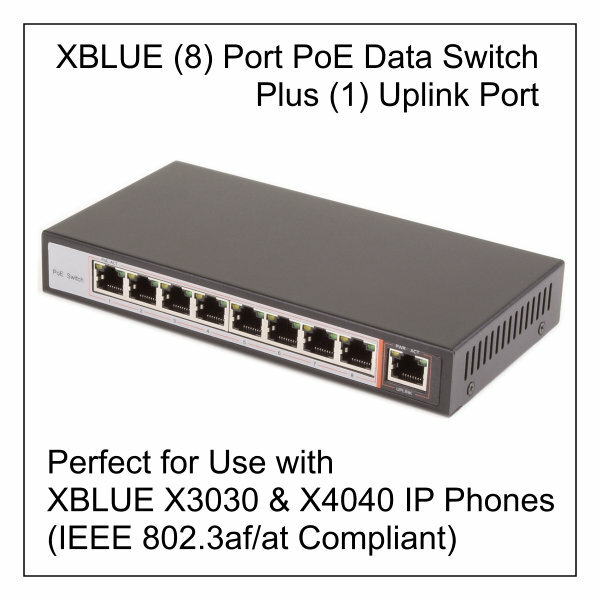 This 8 port data switch has (1) uplink port and (8) PoE ports that provide power over Ethernet (PoE), allowing you to connect and power up to (8) PoE compatible IP Endpoints. The uplink port (9th port) allows the switch to be connected to the network and does not output power. Each of the (9) ports auto-detects connected device data speeds of 10/100 Mbps and the (8) PoE ports provide 15.4W (802.3Af) or 25.5W (802.3at) of power per port. XBLUE offers live U.S. Based customer support. XBLUE PoE switches purchased and operating in the United States and Canada comes with a full year warranty from the date of purchase - includes one year XBLUE product replacement service (ground shipping included both ways). XBLUE's innovative "do-it-yourself" design makes it very easy to self-install which saves you money by eliminating expensive professional installation and programming fees, and our live us based pre and post sales support engineers are ready to assist!